Every now and then there comes along an article that is both transformative as well as informative. 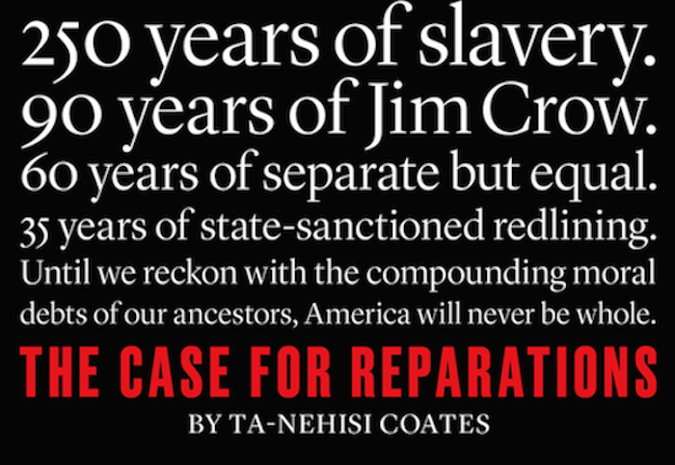 I believe Ta-Nehisi Coates achieve both of these things with his new article for The Atlantic entitled, "The Case for Reparations." This is one of those articles that I feel is definitely a must read, not just for African Americans, but all Americans. I have to admit I could only read the article in pieces. There were several times I had to take a break before I started reading again. It's definitely a hard read. Please read it and tell me what you think. I definitely think this is a conversation that is worth having. The Great Migration, a mass exodus of 6 million African Americans that spanned most of the 20th century, was now in its second wave. The black pilgrims did not journey north simply seeking better wages and work, or bright lights and big adventures. They were fleeing the acquisitive warlords of the South. They were seeking the protection of the law. I did not read the article but I watched several of his interviews about the article. Sounds like he has made the case. I used to think reparations was a wasted argument. But a few years ago, I started to see that it is a worthwhile pursuit.